The Boston Symphony Orchestra’s 133rd season promises variety and no little excitement. The BSO management has done a fine job of choosing repertoire and assembling a cast of characters that should not disappoint even the most demanding of listeners. We can also still hope that before too much longer, the announcement for which we are all waiting will come to us. Subscriptions sales have begun, and the entire list of concerts may be viewed here. As the search for a permanent director continues, the Boston Symphony Orchestra belatedly announces its programs for the coming year, a collection of safe-choice masterpieces, overplayed warhorses, and some interesting premieres, along with a general avoidance of less-often-heard works. Most of the conductors in the guest roster are familiar already and we will surely welcome their return visits. So here are my grumpy off-the-cuff observations. Among the conductors, Stéphane Denève appears for a third year, Christoph Eschenbach, Charles Dutoit, Daniele Gatti and Thomas Adès for the second year in a row, Robert Spano will come for two weeks, and we will have a good stretch of elder statesmen: Christoph von Dohnányi for no less than five weeks, and Lorin Maazel, Rafael Frühbeck de Burgos, and Bernard Haitink for two weeks each. One wonders whether Dohnányi, one of the best in the world, were being considered for the permanent position, but we wouldn’t urge him to go for it unless, at his age (83), he wants it; better he should join Haitink, six months older than he, in the emeritus category. Taking the long look ahead, most of us who watch over these matters would think that the BSO should put its money on a middle-aged master (Koussevitzky was 50 when he came to Boston; Munch was 58) who would be in a position to invest not only his maturity and experience but also his vision for the future in Boston; give him or her a five-year contract, and if necessary, don’t renew it (Ozawa, a peerless technician but an often uninspired interpreter and a drab programmer, certainly stayed too long). Thomas Adès is brilliantly accomplished and equally promising but still young at 40 (Bernstein was considered too young at 31 in 1949, but the real reason he wasn’t selected as Koussevitzky’s successor was that he wasn’t European). Denève and Gatti are both good technicians; Dutoit and Andrew Davis are much more experienced; I don’t know anything about Daniel Harding (age 37, assistant conductor of the London Symphony Orchestra) but his program sounds exciting: a new work by Mark-Anthony Turnage called Speranza, and Mahler’s Das Lied von der Erde. Assistant BSO conductor Andris Poga, 33, will conduct one program, including a new piano concerto by Justin Dello Joio (Garrick Ohlsson, soloist), but I am especially curious to hear the two weeks of another Latvian, Andris Nelsons, two years older, whose new recording of Dvořák’s “New World” is one of the finest I’ve heard. Among the composers, we will get a generous dose of Brahms (Symphonies 2, 3, and 4; Piano Concerto no. 2; Double Concerto; maybe this is because of the 180th anniversary of his birth) and perhaps a too-generous dose of Beethoven, if such a heretical notion were thinkable (Symphonies 3, 4, and 6, and three all-Beethoven programs with all five piano concerti, the Triple Concerto, and all three Leonore Overtures; also the Elegischer Gesang, op. 118, from 1814, for four solo voices and strings, a curious choice, hardly an orchestral piece). Of Wagner we will get the Siegfried Idyll and the overture to Rienzi, and no Verdi at all; we’ve had enough of them in their bicentennial year. (The inclusion of the Rienzi overture reminds me of what Roger Sessions used to say: that every composer, or perhaps every professional musician, ought to be forced once in a lifetime to do penance, by hearing Rienzi, at least in its five-hour-long shorter version.) Meanwhile, everybody knows that this year, 2013, is also the bicentennial year of Charles-Valentin Alkan, and the centennial year of the premiere of The Rite of Spring, but it is also Benjamin Britten’s 100th birthday year as well, and Charles Dutoit promises us a good War Requiem. We will hear some good Mozart: Piano Concerto K. 503 with the excellent Paul Lewis (we heard it last year with the excellent Richard Goode), Piano Concerto K. 414 with Eschenbach solo and conductor (the rest of the program is Bruckner’s 9th), the “Prague” Symphony, K. 504, under Maazel (the rest of the program is Mahler’s 5th), and an evening of small-ensemble music, including the Serenata notturna and the big Serenade for winds, K. 361. I’m not delighted about Andrew Davis’s program: Vaughan Williams’s 6th, which is to my mind a terribly dull work, Prokofiev’s Piano Concerto no. 2, massive but very diffuse; but Rimsky-Korsakov’s Capriccio espagnol will send everybody home in good spirits. Robert Spano will conduct Osvaldo Golijov’s Pasión segun San Marcos, which made a big hit here some years back, but his second program is equally exciting: Debussy’s Nuages and Fêtes (oh, how I wish we could hear Gigues and Rondes de printemps sometime), a new piano concerto by Bernard Rands (Jonathan Biss, soloist), and Rachmaninoff’s Symphonic Dances, his last work and, in the opinion of many, including me, his greatest. (On another program Rachmaninoff will be represented by his Paganini Rhapsody, which the BSO will have programmed for the third time in five years.) Dohnányi will conduct Mahler’s Second Symphony in September, and then, I hope, that work can be retired for a few years in favor of other Mahler. Maazel insists on Tchaikovsky’s Fifth in April; this is another work we ought to be able to do without for a long while. (Two nights later Maazel replaces that warhorse with another incomparably greater warhorse, the Symphonie fantastique, the only Berlioz we will get this year.) Of Schumann we will hear the Piano Concerto (with Perahia) and the Second Symphony, his greatest orchestral work; of Dvořák, the Violin Concerto and the Romance (once again let me sound the trumpet for Dvořák’s late symphonic poems, especially Polednice (The Noon Witch), never performed by the BSO in 150 years); of Shostakovich, the first Cello Concerto and Symphony no. 15. Oh, yes, Richard Strauss: Ein Heldenleben, and on another program, Salome complete, in concert, conducted by Nelsons. Thomas Adès’s program is particularly well chosen: in addition to his own Polaris, Mendelssohn’s Hebrides overture, the Orchestral Set no. 2 by Charles Ives, and Franck’s Symphony (the last time I heard the Franck with the BSO was in the spring of 1957; it was a favorite of Munch and of many others, and half a century later it is surely time for it to fall back into fashion). We will even be able to cherish an all-Ravel program with Haitink (Alborada del gracioso, Shéhérazade, Daphnis et Chloé complete), but Charles Dutoit will also do Le tombeau de Couperin, which I think we had last year; Dutoit is also including a rarity, Krzysztof Penderecki’s Concerto Grosso no. 1 for three cellos and orchestra, plus another warhorse, Elgar’s Enigma Variations. Stravinsky is represented this season only by the Symphony of Psalms; Manuel de Falla, by The Three-cornered Hat, Suites 1 and 2 (why not the entire ballet, which is only a little longer than the suites? ); and we have a seasoning of Musorgsky (Night on Bald Mountain) and Glinka (Overture to Ruslan and Lyudmila; Stravinsky often conducted this and other works by Glinka, of whom he wrote, “His music is unimportant, but he is not; all music in Russia stems from him”). I’ve already mentioned several premieres that will be featured during the coming season, but there are other new or recent works that we should look forward to as well: a Bassoon Concerto by Marc Neikrug, and Steven Stucky’s Music for the Funeral of Queen Mary, after Purcell. It is heart-warming to see such attention paid to living composers, especially those getting on in years; it would be better to see even more. The upcoming BSO season will feature a mix of old and new, in many ways like the past season. Many familiar faces will be returning to lead subscription concerts, starting with Christoph von Dohnányi leading an all Brahms program and the Mahler Symphony No. 2 the following week, with soloists Camilla Tilling and Sarah Connolly. Stéphane Denève, Thomas Adès and Andris Nelsons will lead varied programs ranging from Mozart to Ives to Adès, all in the first month of concerts. There will also be several subscription concert conducting debuts: Daniel Harding, Andris Poga and David Newman, and return appearances by, among others, Charles Dutoit, Rafael Frühbeck de Burgos, Daniele Gatti and Bernard Haitink. Lorin Maazel will close the season with several programs before taking the orchestra on a tour of China and Japan May 1-11. For the piano lovers, Yefim Bronfman will appear in a 3-concert mini-festival from March 13th through March 22nd performing all five Beethoven piano concertos with von Dohnányi conducting, Yuja Wang will perform Prokofiev’s Piano Concerto No. 2, Peter Serkin performs the Brahms Piano Concerto No. 2, Murray Perahia performs the Schumann Concerto, Jonathan Biss will premiere a concerto by Bernard Rands and Garrick Ohlsson will premiere a piano concerto by Justin Dello Joio. Violinist Anne-Sophie Mutter will perform Dvořák’s Violin Concerto and cellist Yo-Yo Ma will appear for the Shostakovich Cello Concerto No. 1, while vocal music lovers will hear Britten’s War Requiem, Strauss’ Salome and Golijov’s La Pasión Según San Marcos. We also look forward to hearing a concert performance of Strauss’s Salome and Bernstein’s West Side Story with live accompaniment to the showing of a remastered print. A new “Insights” series of free public events will take place in conjunction with the War Requiem (7-10 November) and the Beethoven piano concerto concerts (March 9-22). Events will include chamber music concerts and discussions at a variety of locations, including the Kennedy Library, New England Conservatory, Museum of Fine Arts and Harvard University. The Boston Symphony Chamber Players will celebrate their 50th anniversary with newly-commissioned works by Kati Agócs, Hannah Lash, Gunther Schuller and Yehudi Wyner and the Boston première of a new work for flute and string quartet by Sebastian Currier. Gilbert Kalish will join the Players to duplicate a program from their 1st season. Principal bassoonist Richard Svoboda will solo in the world premiere of Neikrug’s Concerto for Bassoon and Orchestra on November 21st. I am excited for Svoboda’s artistry to be showcased in this work. I’m also struck by the programmed pairings for some of these works. Turnage’s Speranza shares an evening with Mahler’s Das Lied von der Erde (with mezzo-soprano Christianne Stotijn and tenor Michael Schade); Rands’s concerto appears between Debussy, movements from Nocturnes, and Rachmaninoff, Symphonic Dances; Dello Joio’s piano concerto is on a program with Wagner, Rienzi overture, and Shostakovich, Symphony no. 15. I wonder what these combinations say about these works—especially the Turnage and Mahler (a study in contrasts perhaps, both thematic and in the use of folk music as source material)? Charles Dutoit will lead the orchestra in Britten’s War Requiem (November 7-9), celebrating the composer’s centenary. Soloists include soprano Tatiana Pavlovskaya, tenor John Mark Ainsley, baritone Matthias Goerne, the Tanglewood Festival Chorus, and The American Boychoir. I’ve long loved this work so am pleased to see this on the program and have high hopes for the concert. Dutoit also conducts what is, to me, the most exciting concert of the season: from October 31-November 3 he will lead the BSO in a concert of music by Penderecki, Ravel, and Elgar. I like Ravel, Le Tombeau de Couperin and Elgar, Enigma Variations, but the excitement for me is the inclusion of the Krzysztof Penderecki to mark the composer’s 80th birthday. Originally premiered by and dedicated to Dutoit, this piece brings to the stage of Symphony Hall the cellists Gautier Capuçon, Daniel Müller-Schott, and Arto Noras. I first heard Penderecki’s music in high school and it was an utter revelation; I am also a cello-nerd. Next season the BSO is offering “Insights” series events surrounding their performance of Britten’s War Requiem and the Beethoven piano concerti. These are free, public events in collaboration with other local institutions. The Kennedy Library and NEC will host discussions and concerts on the twin themes of music and pacifism in conjunction with the Britten. NEC, the MFA, and Harvard join with the BSO to explore “Beethoven and the Piano,” in a series of “lectures, demonstrations, curated film screenings, and ancillary performances” and video podcasts. I’ll be curious to see how these Insights events compare to the short-lived BSO Online Conservatory about Beethoven and Schoenberg in 2006 – 2007. The survey of all five Beethoven piano concertos with Yefim Bronfman, piano, and Christoph von Dohnányi, conductor, in late March brought to my mind the Levine traversal of the Beethoven symphonies between 2005 and 2007. Programming the Beethoven Triple Concerto (this time with Guy Braunstein, violin, and Alisa Weilerstein, cello, joining Bronfman and von Dohnányi) and a couple of the Leonore overtures makes the comparison that much more inevitable. Still, von Dohnányi has drawn the best out of the BSO in recent appearances. Andris Nelsons will lead a concert performance of Strauss’s Salome on March 6th, with soprano Gun-Brit Barkman, mezzo-soprano Jane Henschel, tenor Gerhard Siegel, and bass-baritone Evgeny Nikitin. David Newman will conduct the BSO in Bernstein’s West Side Story, accompanying the newly re-mastered film. Both evenings proffer promise and pitfalls. I’m of two minds about a concert presentation of Salome (and any opera); I miss the Good Friday oratorios of years past (Mendelssohn’s Elijah has stayed with me). I am excited for an orchestral play-along of Bernstein’s film at Tanglewood (Saturday, July 13, 2013), but Symphony Hall as a venue for this program excites me less. Finally, mention should be made of the BSO trip to China and Japan in early May, 2014, under the baton of Lorin Maazel. While Boston-area audiences will not hear these concerts, this exercise in the soft power of cultural diplomacy is increasingly important in our fractious world; I am happy to see the BSO resuming their work in this domain. No mention whatsoever of a new music director. I see that Jurowski won’t be returning next season– only Deneuve and Gatti of the obvious younger candidates. Is is possible that Dutoit or Haitink (or Dohnanyi) will be tapped as a caretaker until they get their act together? Oh– Andris Nelsons is probably another of the young horses. 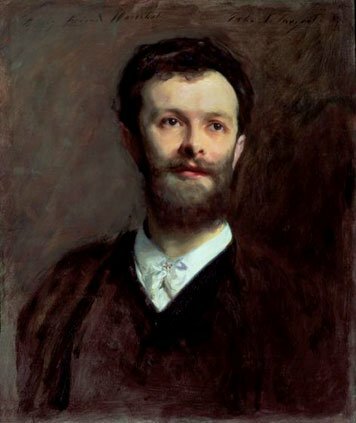 What a lovely Sargent portrait – with its three bold lines and its Munch-like shadow evoking the conductor’s Faustian energy. Since there is an event planned at the MFA, maybe the private owner could be induced to lend it out to the MFA and allow the rest of us to see it? Regarding the scheduled War Requiem, the vocal casting appears to reflect Britten’s intention of Russian/German/English soloists. Looking forward to the performance as well as the associated “Insights” event. Regarding the obvious “younger” MD candidates, I’d also note the reappearance of Robert Spano in a reprise of an earlier triumph here as well as a new world premiere. way too many concertos, some of which would waste thousands of minutes just to seat the heavy instruments. even if they were able to judge the candidates’ music merit, they would be afraid to make predictions of the conductors’ popularity among the press/recording company. The manifest observation is that Dudamel’s ‘success’ is much easier to predict than, say, Gatti’s. Looking forward to the Ades and Das Lied von der Erde. Spano is a plausible candidate, but the Golijov is a complete waste of the BSO’s skills. You could generate an equally satisfying performance of that piece with l’Orchestre du Yanni up there. Gatti, on the other hand, continues to get the chance to deliver the most comprehensive portrait of his ability. After all, we’ll have had Gatti leading orchestral, vocal, and choral masterpieces by Bach, Beethoven, Verdi, Wagner, Mahler, and Stravinsky. If he’s chosen, nobody can say that we didn’t get a good look at him. But no mention of the (optional)chorus for Orchestral Set No.2, which means From Hanover Square North… will not have its greatest impact. Now that I think of it, how moving it would have been to have had the BSO perform that work last or this week. And another Mahler 2 so soon after the October 2010 performances is an unexpected delight. Edente, there will be a chorus for the Ives Orchestral Set No. 2. That concert is on the list of next season’s programs distributed to us members of the Tanglewood Festival Chorus, and that’s the only piece with a choral part, optional or otherwise. I should have been clearer, in that the Ives is the only piece on the October concerts (conducted by Thomas Adès) with a part for chorus. We will of course have quite a bit to sing in the rest of the season! Mr. Owades, thank you for that reassuring news. Orchestral Set No. 2 will be one of the high points of the season for me. I am also particularly looking forward to Das Lied von der Erde. I wonder if anyone is familiar with the soloists? The last two performances of Das Lied by the BSO that I attended were problematic. Ben Heppner was terrific in both performances (1998 and 2008,) but Jessye Norman mailed in her performance in 1998, and I don’t recall that Anne Sofie von Otter in 2008 made a strong showing. One comment on the “Good Friday oratorios” tradition at the BSO: many members of the Tanglewood Festival Chorus are also church musicians, and a series of rehearsals and concerts during Holy Week is a conflict and hardship for those singers. Not having a BSO/TFC gig at that time next season is a real benefit to the chorus. I feel a little out of synch in that it didn’t even occur to me to worry about appearances by candidates for Music Director. I’ve been so pleased with the level of playing that I don’t feel any urgency about the music directorship. My first impression of the list of conductors is that we have a very good mix of old (and less old) reliable and familiar faces, some newer faces returning, and a few new faces. Nice balance. And no gimmicks. A very traditional opening night instead of Anne-Sophie Mutter or Itzhak Perlman conducting. No conductor-less half program (hmmm). There are some premieres and the Ives and the Penderecki (yay!) and Salome (double yay!). A few exciting programs and a few I’m intrigued by. A few I know I’ll be skipping, but nothing to complain about….except maybe that fact that it seems a waste to get Suzanne Graham for nothing more interesting than Shéhérazade. And the BSO 101 programs are continuing. I’ve attended a few and they’re generally good. A session on the audition process was fascinating. An uninterrupted hour of Timothy Genis explaining how he works his magic was extraordinary. “So here are my grumpy off-the-cuff observations.” Mark DeVoto’s remarks now appear at the beginning of this article. For those of us with Friday Evening subscriptions, the bad news is that the utterly pointless “Underscore” series continues to hobble onward and, indeed, takes an ominous step backwards. (1) the earlier curtain time may have made sense in a place like New York, where the bulk of audience may be working in the city, but some of us are coming in from the suburbs and the early curtain made it hard to eat dinner before the concerts (not that there are many places to eat dinner in the culinary wasteland that surrounds Symphony Hall). That wasn’t too big a problem but … (2) the conductors didn’t seem to want to talk (and waterboarding them would be somewhat extreme), so orchestra members were pressed into service — to say a few things about their instruments and tell us what a great place Symphony Hall was … which it is, but how many times do we need to hear this? (3) it began to sink in that cutting the program meant less music at the same price. But least there was the food …. During the second year, we got the intermissions back, the concerts started gravitating towards 8 PM again (a few stayed at 7, if I recall correctly), only the musicians were willing to talk to us, and the food started getting skimpier and the conductors and performers were increasingly loathe to mingle. I believe we are now on year three of this strange experiment: the orchestra members are still telling us how great the hall is, all the concerts are at 8 PM and have full programs, but there’s no food afterwards. While I’ll miss those almond macaroons, I took these changes as a promising sign and figured that by next season the musicians would be freed from the burden of talking to us and civilized life could resume (my guess was that it would take another year for the “Underscore” label to sink quietly away and all of this would become something that I would tell people and they would think I was making it all up). Then I got next season’s program. The musicians are still talking, we’ve kept the 8 PM start time, the almond macaroons and wine remain little more a fond memory, but ….. they’re cutting the program again! We get the Mahler 5, but no Schubert! Have we been bad children? have we not paid rapt attention to the orchestra members when they tell us stories about their instruments? why have we been sent bed without our Schubert?). If this keeps up, I fear that in a few years we’ll be back to 7 PM concerts, all of the programs will be shorter, and the musician will still be telling us how great Symphony Hall is (though I suspect that one brave soul, tired of this nonsense, will simply try to tell jokes … wait a minute, that happened this year … right before the Mahler Third). But no matter what happens I’m confident that we’ll never, ever see the wine and macaroons again. Or, for that matter, a permanent music director. All you say is true and is lamentable, but tomorrow night — Friday Underscore – we still get Schubert (5) with Mahler (4). And the wine, cheese, sandwiches and macaroons are still provided after the BSO 101 programs. That’s quite a nice amenity, especially on those evenings when one can begin at 5:30PM with the BSO 101 lecture, enjoy the buffet reception at 6:30, then pop across the street to Jordan Hall for a concert by the NEC Philharmonia, Symphony, or Chamber Orchestra. A full night, and all for free! Edente is right: getting to hear the Schubert 5 right before the Mahler 4 last night was a brilliant bit of programming, which drives home the point that good programs should be presented in their entirety (even on Friday evenings). And I suppose that this as good a place as any to say that concerts like last night’s leave me wondering whether there is anyone who has done a better job than Haitink in leading the BSO over the last decade or so. But, to turn from the sublime to the perplexing my rant about the “Underscore Concert” missed one other subtle difference: business suits. After the Gatti performances of the Mahler 3rd I ran into a colleague who was unfamiliar with the “Underscore” format and, after praising the performance, asked “what’s with the business suits?” I hadn’t really noticed that, for “Underscore Fridays,” the orchestra suits up in what, I suppose, counts as “causal Friday” attire in the concert world: suits, rather than white tie and tails for the men (having already confirmed that I’m no fashionista, I’m not sure what, if any, difference there is in what the women are wearing). This completely negligible aspect of the “Underscore Friday Experience” (let’s hope I never see that phrase offered without a snark) suggests the following offer to the BSO management: we Friday evening subscribers will let you retain the goofy title, we’ll allow the male members of the orchestra to continue to offend our fashion sense (not much of a sacrifice for me, after all), and we will satisfy our desire for almond macaroons at our own expense …. but don’t edit our programs! I think the BSO may have tipped their hand as to who the new music director is going to be. Did anyone notice what I noticed in the new 2013/14 season program book that was sent out to subscribers for renewal? To take a step back, having looked at these books every year over the many years, there’s a certain pattern I’ve noticed. That is, they always put upfront the personalities in a sort of order of perceived importance. It’s always been that way. When you immediately open the book, there are pictures of three musical figures there to greet you. In the center, with the largest photo, is Bernard Haitink (which is entirely fitting). To the left is Anne-Sophie Mutter. And to the right is…. Given how much effort the BSO puts into making this booklet every season and all the thought that goes into placements within it, I believe that the BSO has tipped their hand here. I don’t think that Nelsons has achieved “top billing” within the booklet purely by coincidence. Interestingly, Daniele Gatti’s (small) picture is near the very back back of the book on the Friday subscription series page, well after pictures of many others including Stephane Deneve and Rafael Fruhbeck de Burgos. I also believe that if Vladimir Jurowski were a serious candidate, they would have managed to fit into some program during the season and he would have juggled his schedule to make sure he would appear here. His absence seems to suggest he is not a front-line candidate at this point–and I’m not unhappy if that’s the case. I heard him conduct two programs last season, one with the BSO (Shostakovich 4), and other with his own orchestra, the London Philharmonic (Shostakovich violin concerto and Beethoven’s 5th), and with all due respect to Jeremy Eichler and others, did not care for either concert. Based on the two concerts I heard, I have no idea how Jurowski has received the press notices he’s received in so many places over the years, because he struck me as being in the minor leagues more than anything else. I’m sure we will all have answers soon enough. But my best guess is that the BSO has tipped their hand here. In writing what you wrote, have you perchance relistened to Shost 4 online (CRB BSO ConcertChannel)? No, I haven’t. I was at the Thursday evening concert in the cycle and heard it live. It seems pretty clear to me based upon the comments that were left here at the time, that the people who had such an overwhelming reaction to the performance mostly were not really familiar with the work. I am, on the other hand. Shostakovich’s 4th is what I call an “impact symphony”–that is, it’s a hugely impactful piece of music, even in a not very good performance. Five years prior, we were fortunate to have another performance of the symphony here in Boston conducted by Sir Mark Elder, which was, hands down, one of the finest BSO concerts I’ve heard in the last decade. Elder was completely inside the music and put across a chilling, unnerving, edge of the seat, and utterly astonishing interpretation that went right to the core of the music. I wish I had a recording of it, it was that good. Elder’s was truly a great performance in every way–and the playing of the BSO was exceptional. In comparison, Jurowski’s performance was routine, nowhere near as impactful, and frankly, unmemorable at least to these ears. To this day I still hear the Elder performance in my head, but I can’t say the same for the Jurowski. Jurowski’s lived in the moment and seemed to lurch from section to section without any sense of the longer line. It was never more than the sum of the parts, and many of the parts were neutered it seemed to me. And that’s the same criticism I would make from the other Jurowski concert I heard. I’ll admit two concerts is still a small sample, but in neither concert did I think he even came close. I’d still listen to a Jurowski performance, but I wouldn’t go out of my way to hear it. Was not defending him specifically, just often find it instructive to check my first reaction whenever possible. Of course you would know it was his work, so not a blind test. I have seen Elder on several DVD-Rs sent to me of BBC Proms telecasts over the years and will second the motion on Sir Mark. He’s an excellent conductor, whom the BSO should bring in more often. Same with Donald Runnicles. Mark DeVoto: you should check out on YouTube Daniel Harding’s superb performance of Beethoven’s Fifth. Somehow he has not gained much critical traction in his appearances with the NY Philharmonic. For BSO management not even to comment in a general way on the search at this point (when fundraisers were telling those solicited that the choice would be made by the end of April) is not very sporting of them. My guess is that they tried to entice Gatti without success. If that’s the case, I’m not heartbroken. Bottom line: whoever gets the position, it will be someone a few cuts down from James Levine. That’s the very sad elephant in the room. Even Harding does the opening more 1-2-3-FOUR than as written, alas: (breath)and-two-and-*ONE*. The rest is nicely driven. Totally concur in view of Levine. A real pity about his health. Upon further examination, I find there are conductor-less concerts hidden away, one night in January with Richard Goode and one in March with Menahem Pressler. The scheduling is odd — two standalone evenings — but that called my attention to the even stranger fact that there’s just a single performance of Salome scheduled on March 6, with the same cast that’s performing the opera under the same conductor, Andris Nelsons, in Carnegie Hall on March 1 with the Vienna State Opera. It’s an interesting way to mark the Strauss anniversary, but that’s a lot of rehearsal for a single performance. Whether it means anything more I’m not prepared to speculate. Music director correctly predicted in this thread.